A more subtle design makes for the perfect setting for intimate dargen dining. Club Price: £215.99 - Save: £24.00 Join Today! A subtle design created for intimate dining or relaxing. A smaller table within the Zest 4 Leisure collection, but still beautifully crafted to fit in any garden. The Katie Round Picnic Table has four separate bench seats that can easily seat 4 adults or 8 children and has room for a parasol. 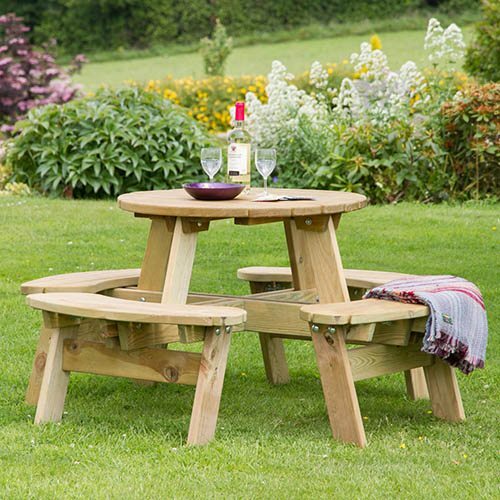 The Katie Round Picnic Table is manufactured from high quality, pressure treated, FSC® Certified timber to last longer, and comes with 10-year guarantee against rot so you can be sure that this product will last and remain to be a beautiful feature in your garden. Dimensions: 1.47m Diameter x 0.72m, assembly required - This product is 2-person assembly.